"Embedded in the night sky are archetypal images, symbols, and stories that have enchanted the human soul for aeons. Onto this sanctuary of the sky the sky the ancients projected their imagination using the star-patterns to animate their myths and create the skyscape that shapes the imagery of Celestial Tarot. Underpinning the seventy-eight cards of Celestial Tarot are the ancient traditions of astrology, astronomy, and mythology. Celestial Tarot makes a great impact as it not only amplifies and broadens the meaning of the contemporary cards but it also utilizes the oldest forms of divination." Mr. Clark is an Accredited Astrology Teacher (AAT) who has taught astrology for the past 25 years at the Chiron Centre in Melbourne, Australia. 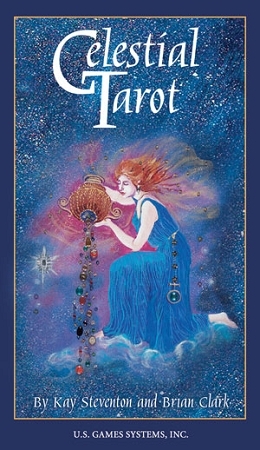 Kay Steventon, creator of the Spiral Tarot, is a professional artist, astrologer, and Tarot reader.